Come and join fellow SCS students at the MACES Building this Friday for an evening of Art & Culture. 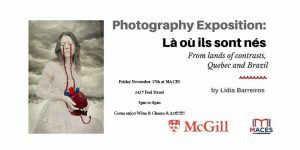 This Photography Exposition by Lidia Barreiros is going to be an eye-opening showcase – “From lands of contrasts, Quebec and Brazil”. Come enjoy wine & cheese, & Art!